The forward-looking technology of spintronics now has a new, highly effective investigative instrument: German physicists from Mainz and Berlin have successfully employed ultrafast terahertz spectroscopy to determine the basic properties of spintronics components. "We thus now have direct access to the most fundamental elements of magnetotransport," said Professor Mathias Kläui of the Institute of Physics at Johannes Gutenberg University Mainz (JGU). Spintronics uses not only the charge of electrons for the purpose of information processing but also their spin, or in other words, their magnetic moment. The principles of spintronics are already being employed in hard drive reading heads and sensors, such as those used by the automotive industry, and offer enormous potential with regard to the development of non-volatile memory systems. The basis of many spintronics-related applications is the giant magnetoresistance effect or GMR, which was discovered in the 1980s by Albert Fert and Peter Grünberg, who were awarded the Nobel Prize in Physics in 2007 as a result. The GMR effect works like a kind of magnetic sensor, the resistance of which changes depending on the magnetic orientation of the individual thin films in the composite material. This leads to a certain scattering of electrons, the effect of which becomes apparent as resistance. However, it has not proved possible to date to precisely measure this effect with the experimental methods available. The main problem was the extremely short duration of these effects. The electron scattering events occur on a time scale of less than 100 femtoseconds, a femtosecond being one quadrillionth of a second. In a joint project involving the research groups of Mathias Kläui at JGU and Dmitry Turchinovich at the Max Planck Institute for Polymer Research in Mainz (MPI-P) and also the Mainz-based Sensitec GmbH and the Fritz Haber Institute of the Max Planck Society in Berlin, the collaborating teams were able to overcome this challenge using terahertz spectroscopy, also known as submillimeter wave spectroscopy. 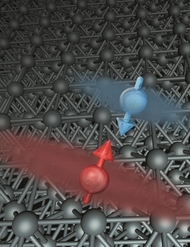 With the help of this technique, the researchers were able to directly observe magnetotransport in a ferromagnetic structure and then precisely and distinctly measure the relevant parameters, i.e., the spin-dependent charge-carrier densities and the spin-related scattering times of the conducting electrons. "Terahertz spectroscopy is often used to analyze materials. We have now demonstrated that this method can also be employed to measure magnetotransport," explained Professor Dmitry Turchinovich, who heads the Ultrafast Dynamics and Terahertz Spectroscopy research group at MPI-P and is a member of the Materials Science in Mainz (MAINZ) Graduate School of Excellence at Mainz University. "And we have also provided the first experimental confirmation of the so-called Mott model that was initially proposed in1936 and describes electron transport in ferromagnetic metals." 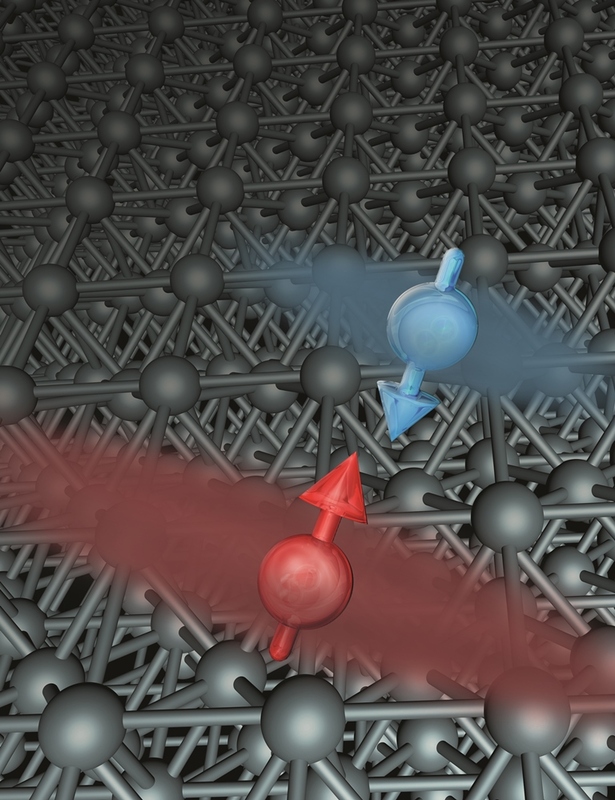 The results show that the original estimates of spin asymmetry in electron scattering, which is a core factor determining giant magnetoresistance, were significantly underestimated. "Our findings mean that a new and effective quantitative tool is available for research into spintronics, namely ultrafast terahertz spectroscopy," added Professor Mischa Bonn, Director of MPI-P and a member of MAINZ, who was also involved in the work. "This new method provides us with direct access to the most basic parameters that underlie the magnetotransport that occurs in material samples. I am particularly pleased that this exciting research was made possible by collaboration between the two groups at MPI-P and at JGU within the MAINZ Graduate School," concluded Mathias Kläui, Director of MAINZ. The MAINZ Graduate School of Excellence was originally approved as part of the Federal and State Excellence Initiative in 2007 and received a five-year funding extension in the second round in 2012 – a tremendous boost for the Mainz-based materials scientists and for the sponsorship of young researchers at JGU. The MAINZ Graduate School consists of work groups at Johannes Gutenberg University Mainz, the University of Kaiserslautern, and the Max Planck Institute for Polymer Research in Mainz. One of its focal research areas is spintronics, where cooperation with leading international partners plays an important role.